* = Monster related. This means it's not a regular monster set, but there are significant monsters in it. 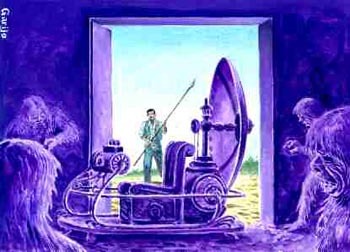 Sci-fi and fantasy sets often cross-over in this regard. Monster collectors can explore these series to see if they are of interest. Mad Hot Rods (Allens & Regina, circa 1970s?) 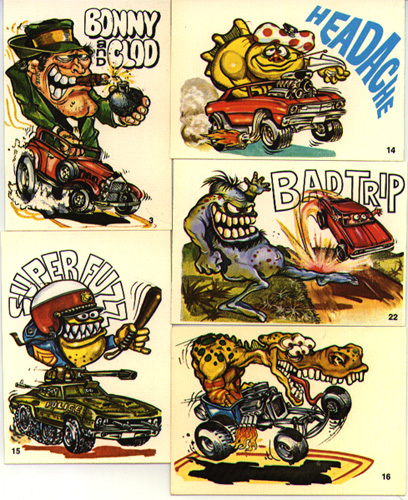 A 42 sticker set in the tradition of Odd Rods, but from Australia/ New Zealand. 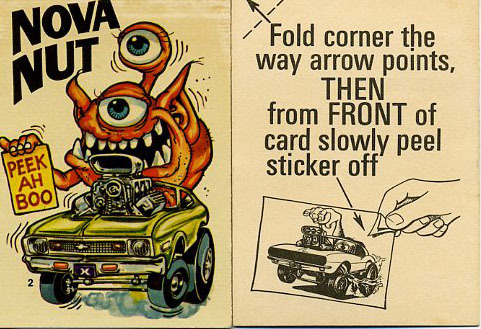 It features colorful monster hot rods and their gruesome drivers. Retail: Uncertain. 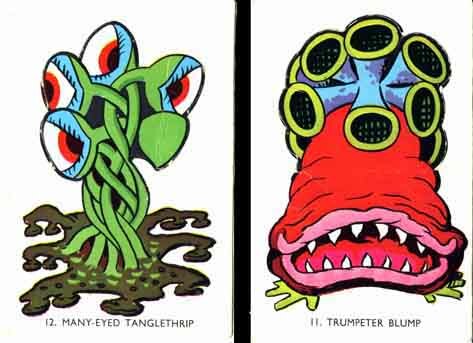 Mad Moon Monster cards (Sunicrust Bread, Austrailia, circa 1970s) Colorful but rather unthreatening monsters inspired by the likes of Basil Wolverton. Each card measures 5 x 8 cm and it is believed that the set consisted of 40 or 50 cards. No copyright date is provided, but it is believed to be 1970 or 1972. They came with tabs on the bottom that included a dotted line on the backs instructing collectors to cut them off. Sample titles include: #2 – Happy Bloat, #8 – Crying Gaggle, #11-Trumpeter Blump, #12 – Many-Eyed Tanglethrip, #24 – One-Eyed Frilletoid, #31 – The Greedy Greebie, #32 – The Trunky Roller. (See more samples.) Low supply and low demand item. Retail uncertain. 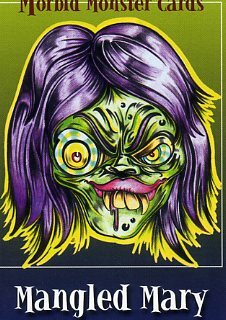 Make Your Own Name Stickers (Topps 1966) Basil Wolverton monster art, same as Ugly Stickers (also Topps) and Monstickers (also Topps), but these are just a LITTLE more serious. 33 color stickers. (Blank sticker backs.) Retail: $150-$250 Ex/Nrmt. 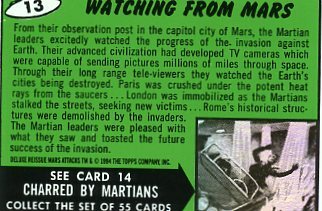 Mars Attacks Delux /Archives (Topps, 1994) The official Topps re-issue of the classic 60s sets, plus 45 more cards from various artists. The backs used a green background instead of the original salmon color, and the black and white photo previews of the next card in the series were done with a prismatic effect. 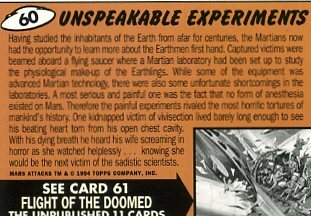 There was also an extra 11 cards added to the base set (#56-66) with more storylines on the backs, plus more Martian art for cards 67-100 with trivia information on the backs. (100 card NRMT/Mint set) Retail: $60-$75. Included two per box were four Matrix (color prism renditions of art from the original series). 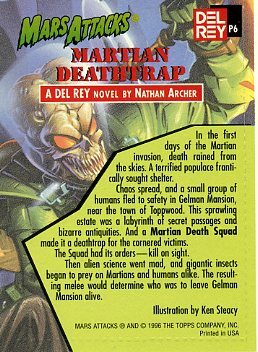 Mars Attacks-- Del Rey Books insert (Topps, 1996) At least four different cards promoting the comic book series by Topps. 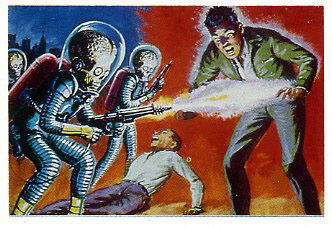 2 cards per strip (inserted in Del Rey Mars Attacks books. One is numbered P5, the other P6. See back. Retail: Uncertain. 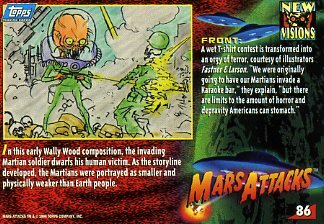 Mars Attacks Invasion (Topps, 2013) A reboot of the classic franchise from the original creators, only with a larger number of artists. Also different is a uniform look of the finished set, so there is a broad array of quality and style. Most of the artists are really great, while a few are somewhat cartoonish. Topps went overboard on chase sets and parallel subsets for this series (including a "heritage" parallel set with white borders, instead of the bull bleeds of the regular set). The odds of making a complete master set are literally out of this world. 95 card base set retail: $15. 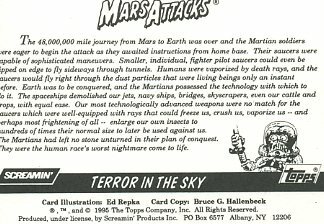 Mars Attacks Pocket Comics cards (Pocket Comics, 1988) A 55 part series of mini comic books was planned to tell the Mars Attacks story in expanded form, including a center fold of each card. Unfortunately, only four were published, but they included "cut out" cards on the box offering previews of the next chapter. See back. 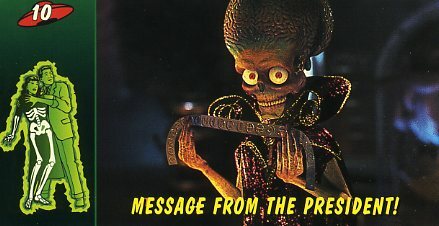 There were also 2 large Mars Attacks buttons and 1 small button made to promote the mini-comics. Retail: $9 Low supply, low demand item. 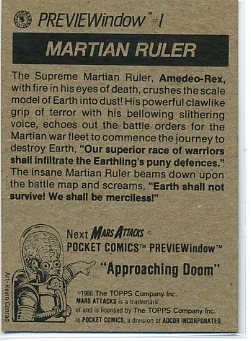 Mars Attacks Philly Convention Promo (Topps, 1996): Features the Mars Attacks color wrapper on the front and text on the back. Given to patrons of the 25th annual Philly convention. Retail: $5-15. 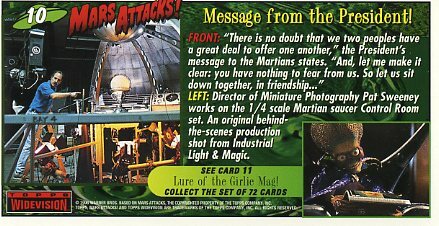 Mars Attacks- Screaming Models (Screaming, 1995) Nine different cards with original Mars Attacks paintings based on the models issued by Screaming. 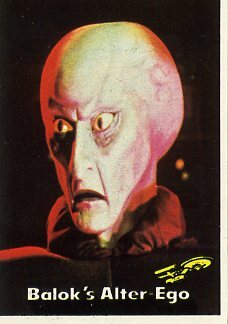 The 9th card is a bonus card featuring three Martian faces, and it's also available as an oversized (6" x 8 6/8") card. See back. Retail: Uncertain. 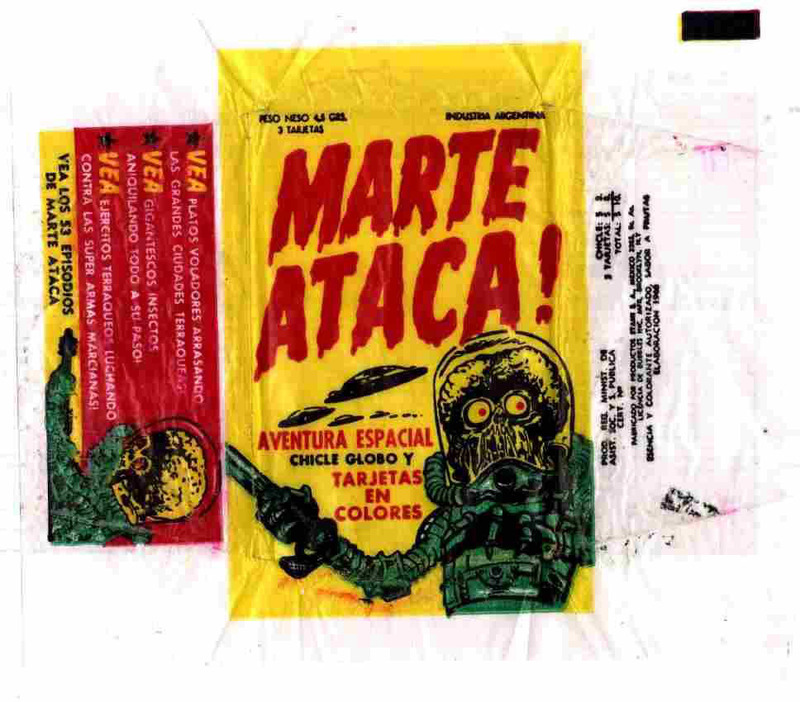 Mars Attacks- Spanish version (Late 1960s or early 1970s, Argentina) 53 card set bootleg of the Topps version with rewritten text. with a yellow backgrounds on the reverse. Rare in the USA. See the rare wrapper here. Retail: Uncertain. 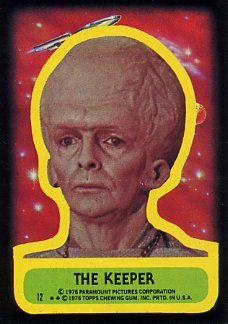 Mars Attacks- The Unpublished Version (Rosem, 1984) This is a set of 13 cards that were the "toned down" versions that Topps considered replacing the more controversial cards with. 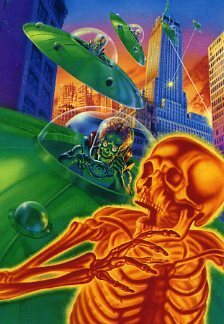 In the end, no revisions were issues and the entire Mars Attacks series was discontinued. This set limited to 1,000 numbered sets. The backs are all the same. Retail: is usually around $50. 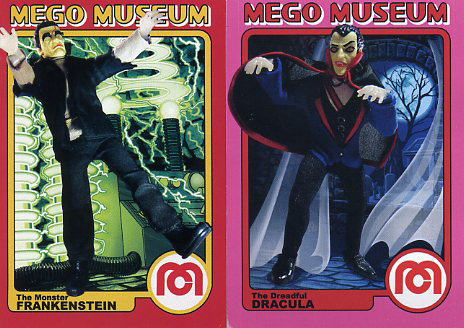 Masters of Horror (Imagine, 1993) Three card set of black & white promos featuring Christopher Lee, Vincent Price, & Mike Mazurki. The regular series was never issued. (See backs.) Retail: $2 each. 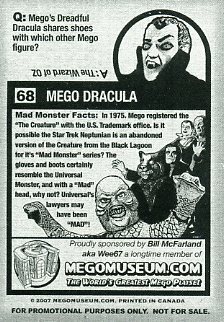 Mego Museum Monsters (Mego Museum, 2007) A subset of an ongoing series of promos showing various plastic action dolls put out by Mego in decades past. 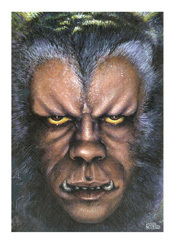 The monsters in the subset were (2) Draculas, (2) Frankensteins, a mummy and a werewolf (numbers 66-71). The other characters in the series goes up to 90. (See back.) See also the detailed review and checklist. Retail: Made not to be sold, only traded. 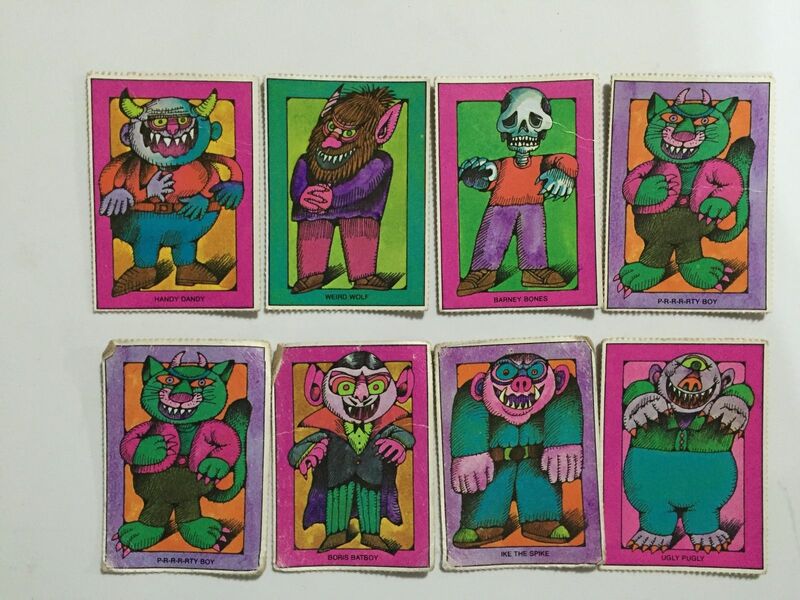 Menko Monster Cards (Japan, 1960s 1970s for most monsters) Menko is a Japanese card game played by two or more players. The size is usually 18.5cm (7.6" ) x 15.5cm (6.4"). The sparse backs are in Japanese but are mostly symbols or logos. Each player uses Menko cards made from thick paper or cardboard, with one or both side printed with images from anime, manga, etc. A player's card is placed on the hardwood or concrete floor and the other player throws down his card, trying to flip the other player's card with a gust of wind or by striking his card against the other card. If he succeeds, he takes both cards. The player who takes all the cards, or the one with the most cards at the game's end, wins the game. There are many subjects, including military (before the war) and baseball after the war. 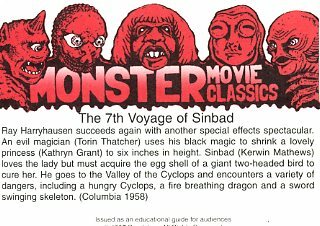 Most the monsters became popular in the 1960s and 70s and seem to be cartoons like Tobor the 8th Man and Astro boy. Live action monsters (photos) include Godzilla and Ultraman. Retail: Unknown. 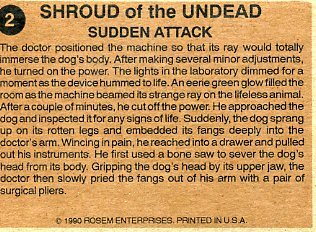 Midnight Madness (Rosem 1990): This series came in a beautiful die-cut full color box that has pull tabs to make various graveyard characters move back and forth. 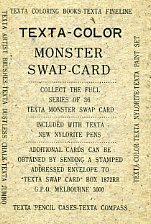 It contains all eight packs which each contain a twelve card set of Midnight Madness monster stories. One of the few modern sets with a continuous story on the backs. Packs were also sold separately for $2 each. Only 1,000 of these boxes were made (each numbered). Retail: $15-$25 for the full box. 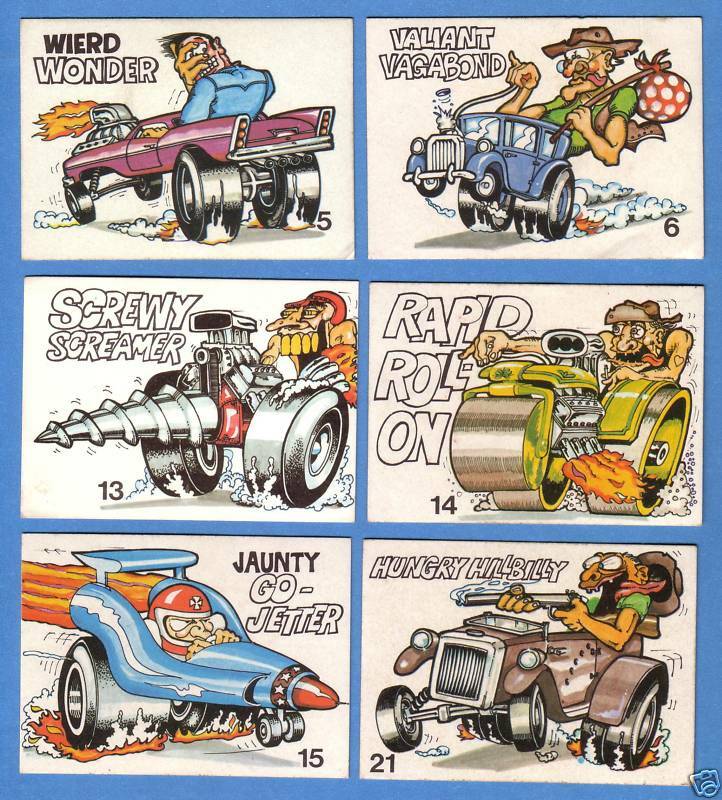 Mini-bombs Trick Noise Maker Cards (M. Kapp, 1992) Six different color cards printed on the backs of novelty toy boxes. The cards are perforated and regular size. The backs are gray with text. The cards are #01: Attack of the Dinosaur, #02: Rat Fight, #03: Desert Destruction, #04: Bat Warfare, #05: Creatures from the Gorge, #06: Mutant Worms. Retail: Uncertain. 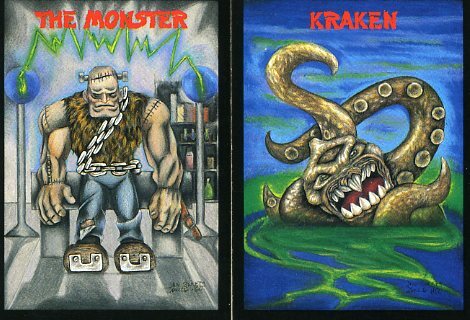 Monster Art of Mike Sosnowski (Studio E, 2011) A 36 card series of stylized monster paintings by Mike Sosnowski sold in factory sets.The backs form a large puzzle. Retail: $15. Monster Cards (Rosan? 1966?) 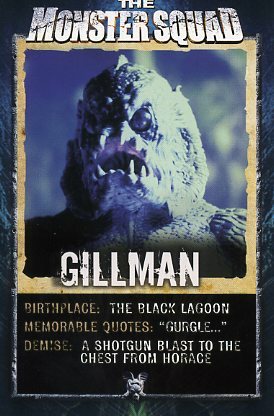 84 blue & white photo set of famous and not-so-famous monster movies, with a crude cartoon image on the reverse and bad jokes below the title of "Monster Cards". 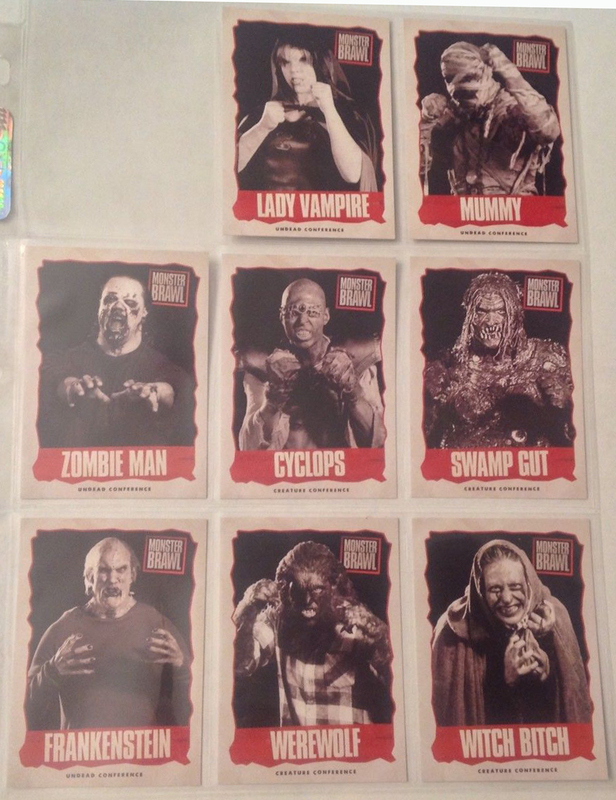 This is thought to be a "knock-off" set of Horror Monster sets. They are basically the same images, but not as professionally produced. Usually found as complete sets in high grade. Retail: $100-$175 Nrmt. 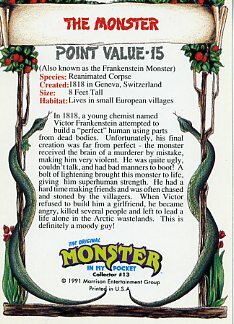 See our special Horror Monsters Profile Page (for details about the origin of Monster Cards). See more of the set. Monster Choke 'N Gag (RRParks Cards, 2014) A mini sized 25 card set inspired by Monster Midgees. 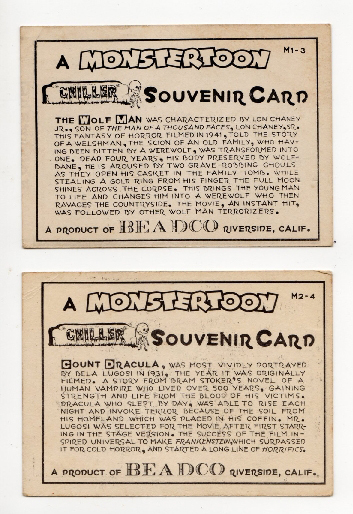 Measuring just 1.9" x 3.25" in size, the black and white photos of classic monster movies sport a red banner below them with the gag line. Retail $6.80. 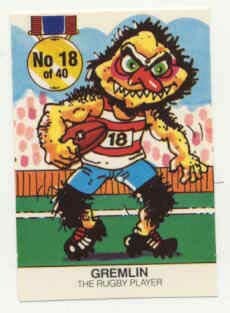 Monster Doublies (Nabisco (Australia), 1982) A series of 12 cards/ stickers that were included in Weeties cereal boxes (one per box). 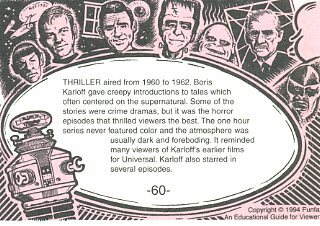 At least 5 of the images were Universal monsters, so the other seven were probably also Universal characters. The size is also unconfirmed, but probably 2.5 x 3.7". 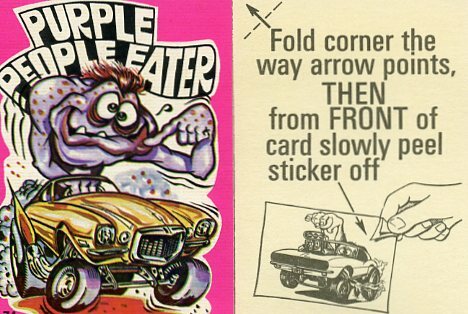 They were called "doublies" because the front was a card, and the back was sticker of the same image-- so they were "double." Retail: Unknown. 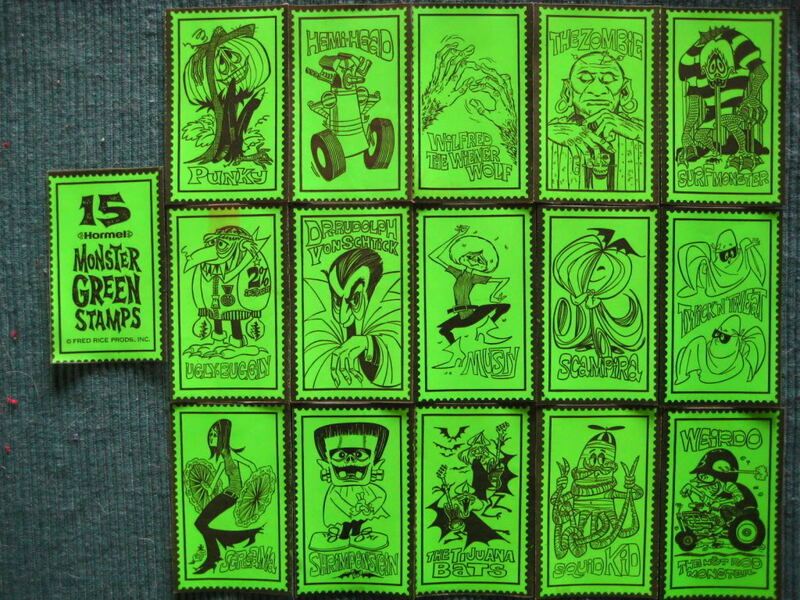 Monster Green Stamps (See "Shrimpenstein Fan Club"). 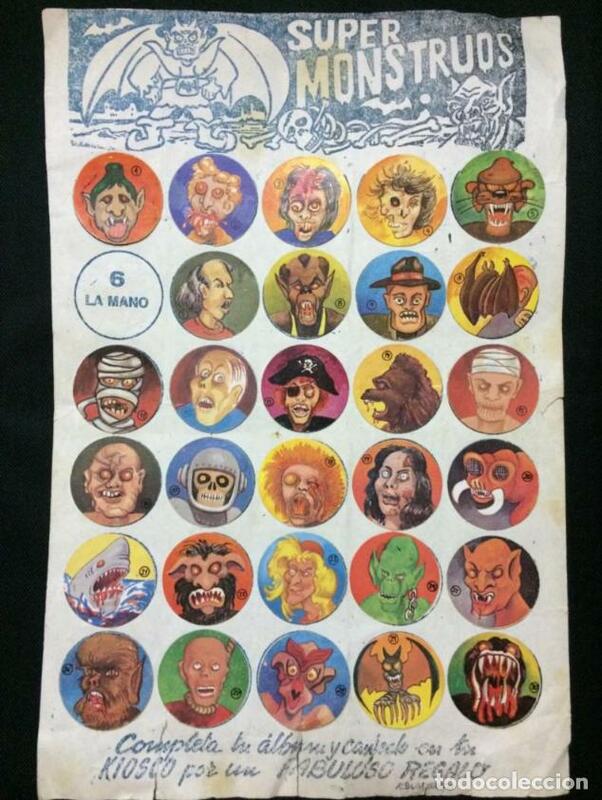 Monster Gum (Spanish vintage issue): A group of at least 8 different Monster Bubble wrappers, sold with gum. 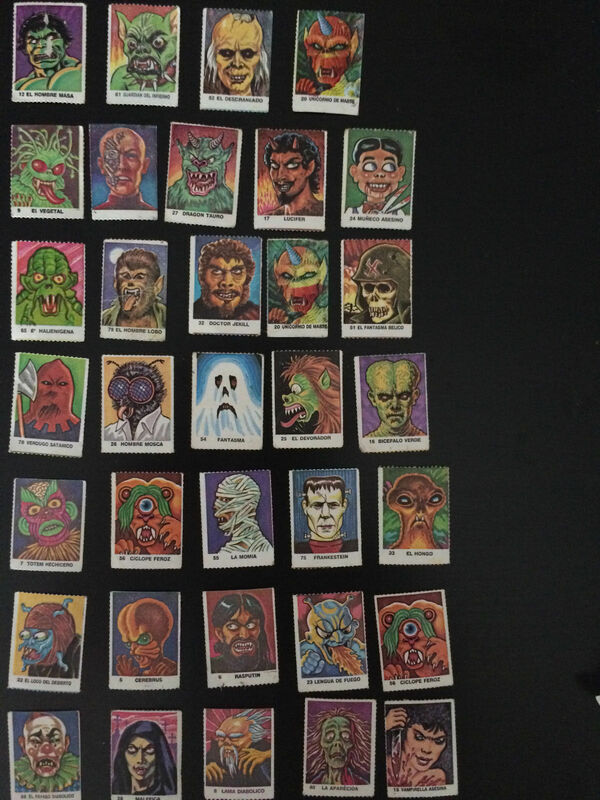 Each packs has a Monster pictured and a name much like the Topps Ugly Stickers did. 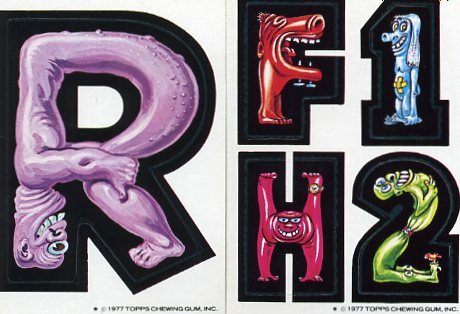 See Monster Chews as a similar English version of the same set. 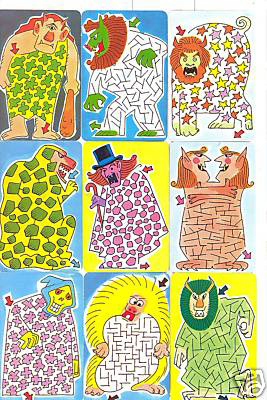 Monster In My Pocket Stickers (Panini, 1992) At least 228 different stickers of colorful monster drawings (some of the artwork of which if pretty crude.) It's based on the Morrison Entertainment Group card series of the exact same name (I added "stickers" to the title to reduce confusion). There are lots of additional color illustrations drawn in a more comic book style. 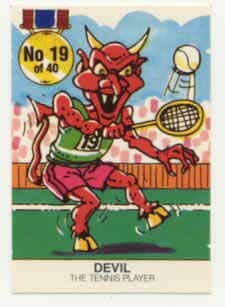 Like all Panini stickers, they are smaller than standard US cards. Retail unknown. 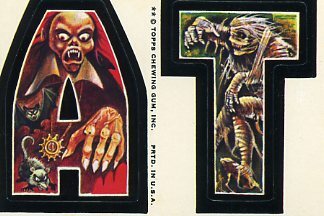 Monster Initial Stickers (Topps, 1974) 132 sticker set with two monster letters on the front, blank sticker backs. There was also 9 puzzle cards distributed in packs (see reverse). There is no "MA" sticker as reported in various guide books. Retail: $250-300 Nrmt. 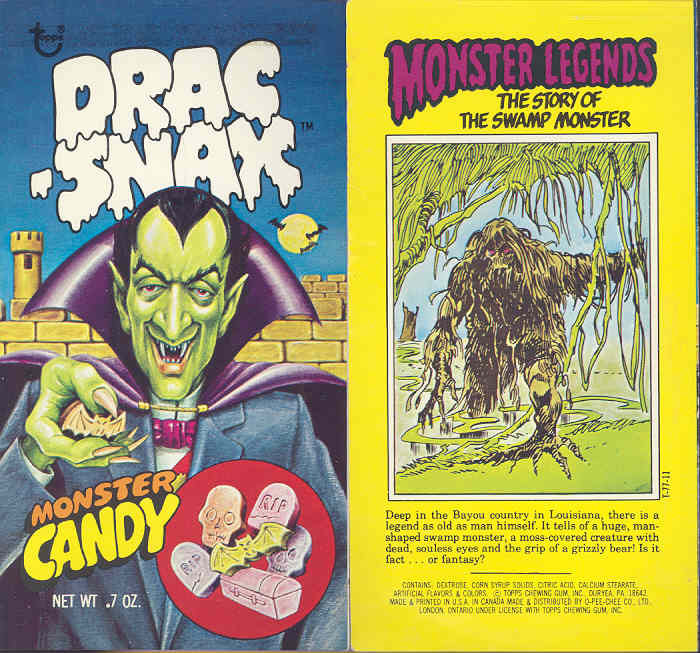 Monster Legends (aka Drac-Snax Monster Candy. 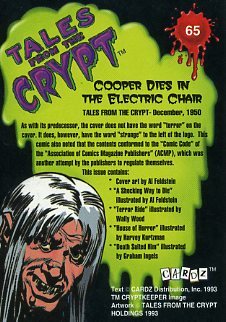 Topps, 1977) A rare test issue wrapper (3 1/2 x 6 1/2 inches) with a Monster Legend (story) and color illustration on the reverse. 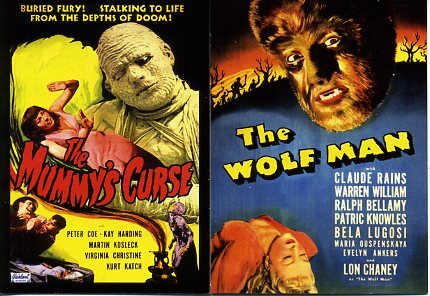 There is no number listed and the set size is unknown, but five verified titles are "The Story of Mr. Hyde", "The Story of the Swamp Monster", "The Story of The Werewolf", "The Story of The Mummy", and "The Story of Dracula." See also the wrapper. Retail: Unknown. 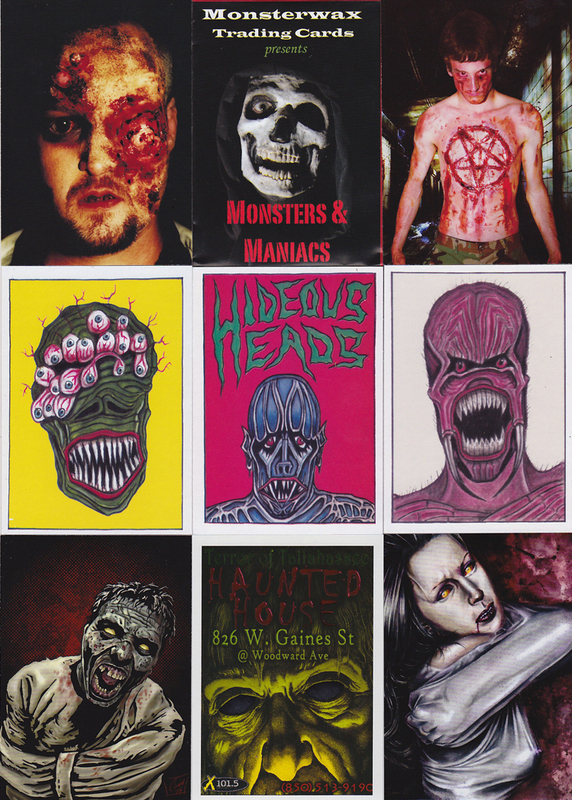 Monster Masterpieces (House of Monsters, 2003) Ten postcard sized (4x5") color cards with nice art by Scott Jackson, and text by Barry Kaufman. 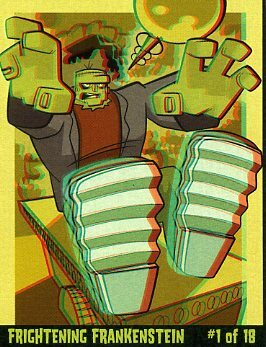 The two planned on releasing ten more cards each year until 2008, when they will re-release the entire series of 50 in a regular card sized set. 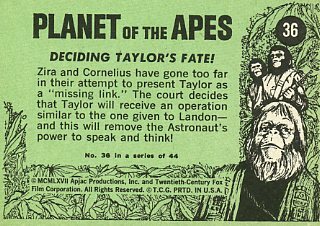 Unfortunately, the plan stalled after series 1 (of ten cards), although promos for series 2 were published. (See back.) Retail: $15 per ten card set. Monster Metal (2016, Sidekick). 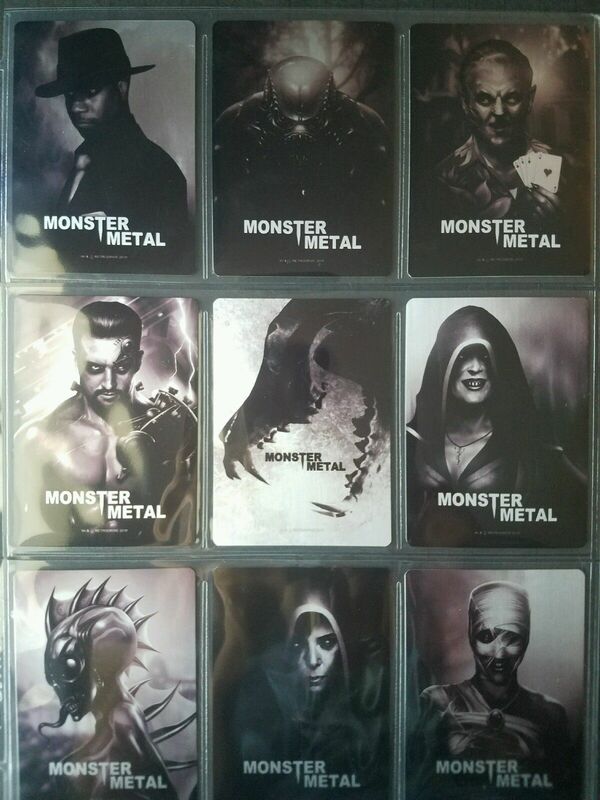 Nine metal card collection of modern monsters and maniacs (including Hannibal Lecter). This series was sold on Kickstarter in small quantities with several different variant colors (for different pledge levels). Retail: $50. 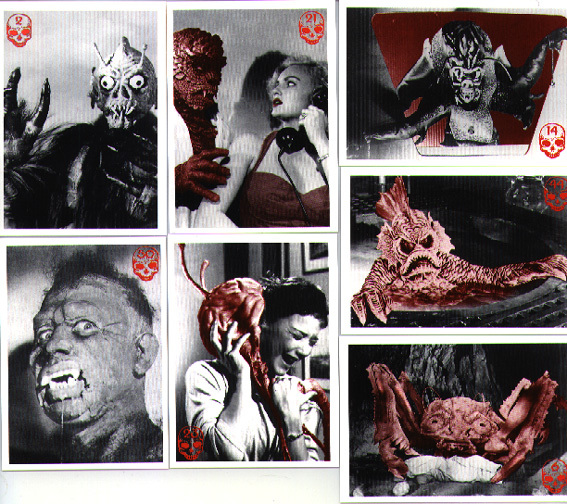 Monster Movie Classics (Reed, 1997): 51 card color set of the horror and sci-fi movies from 1930s to 1969. (Curse of the Demon, Forbidden Planet, War of the Worlds, The Thing, etc.). The backs give details about the classic fright flick on the front. Retail: $18. See Set Profile. 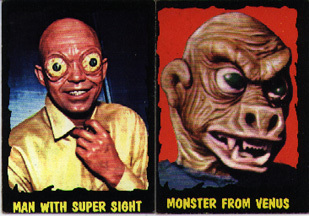 Monster Movie Classics Promo set. 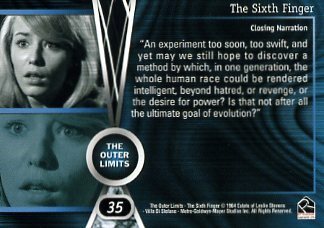 Six promos (P1-P6), mentioned here because they feature movies not included in original set. See Set Profile. Monster Movie Classics 2, The Attack of the Killer "B" Films! 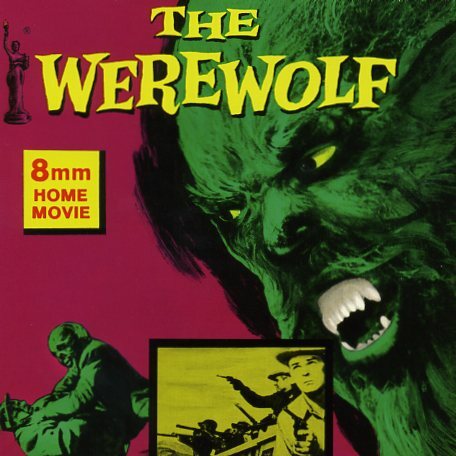 (Reed, 1997) Featuring the monster flicks of the 40s, 50s and 60s that were small in budget but BIG in imagination. Fun fright flicks include Plan Nine From Outer Space, Frozen Dead, Beast with a Million Eyes and many more! 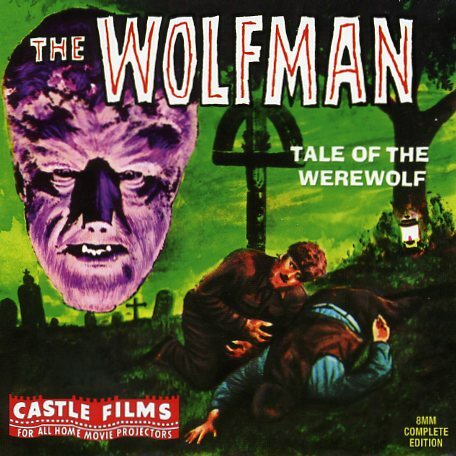 Set features a two color process (like the old time Horror Monster series) that creates a 3-D effect. The backs tell about each movie. Retail $15. See Set Profile. 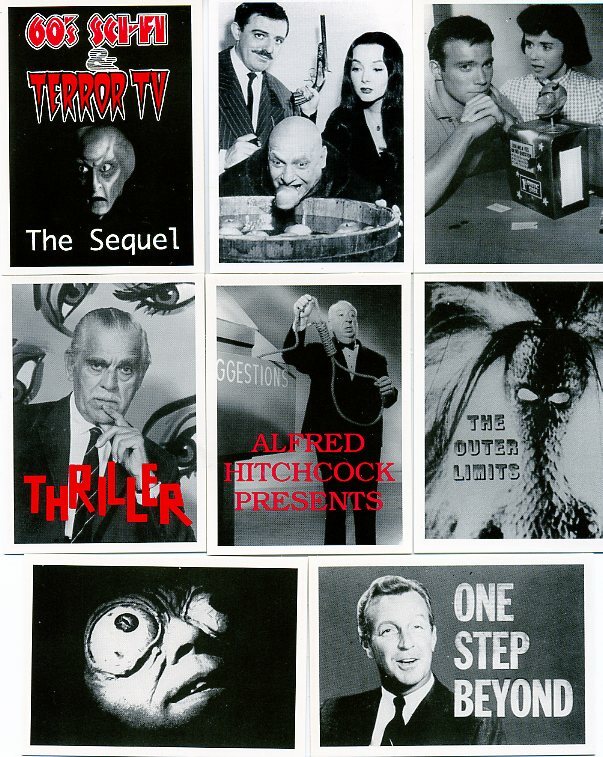 Monster Movie Classics 2 Promo Set: Three card promo set to the above series, mentioned here because they have photos not seen in the regular set. All three retail: $3.95. See Set Profile. 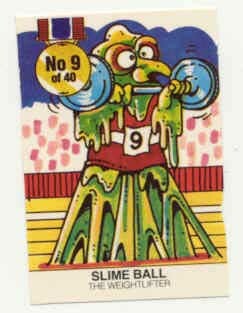 Monster Olympics (an unknown UK publisher, circa 1980s) Smaller blank backed English cards released in the UK. 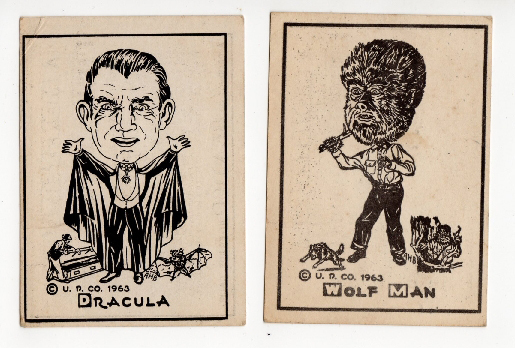 Two series were reportedly issued, the first one just 18 cards measuring 1 7/8" wide and 2 13/16" tall. The artwork is rather crude but quaint. The most identifying aspect of this series is the number on each card, which appears as "No. _ of 18" logo, which is made to look like a piece of paper stuck in the top left corner with a tiny knife. 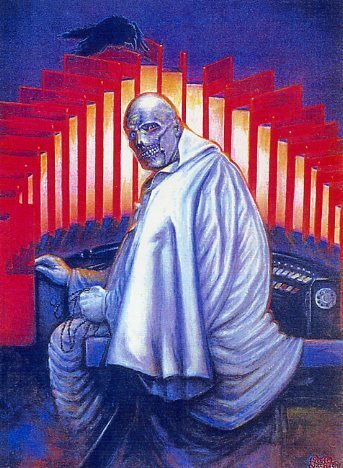 Since there is no checklist provided, here is one: #1 The Evil Troll, #2 The Blob, #3 The Bonesucker, #4 Mr. Hyde, #5 The Werewolf, #6 The Zombie, #7 The Bride of Dracula, #8 Slimeball, #9 The Phantom of the Opera, #10 The Headless Ghost, #11 Creature from the Pit, #12 Four Eyes, #13 Frank N. Steins Monster, #14 King Tut, #15 Count Vlad, #16 Quasimodo, #17 Egor, #18 Attila The Hun. Here are the other 14 card images: (batch 2 and batch 3) The second series was larger, supposedly 50 or so, and had a pronounced sports theme. Many of the same 18 monsters from the first series returned doing sports activities, something that was basically missing the first series. Other characters in the second series included Octy, Fungus (or fungi) ... and he (probably) played soccer or sprinted, and (perhaps) the Purple people eater. 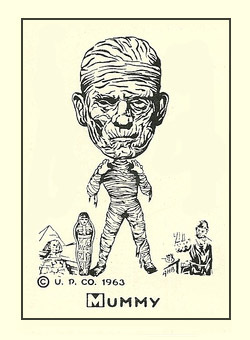 Monster Pin-ups (Phoenix Candy, 1963) Six candy boxes with a cut-out photo of Frankenstein (#1), Dracula (#2), The Creature of the Black Lagoon (#3) Wolfman (#4), The Mummy (#5) and The Phantom of the Opera (#6). The backs are blank. Retail: $50 to $100 each. Monsters, The Blood Edition (Unknown company, Spain, 2016) This is a “special Edition” of Monsters, advertised as a 40 card base set and “Including the award-winning chrome, the special Bonus chrome (which is achieved by redeeming the award-winning chrome) and limited edition No. 0 (Legendary Chrome).” I’m not sure if that means it’s all different art or that the 40 card base set is recycled images from Series 1. 500 paper albums to paste them in were offered. Retail: Unknown. 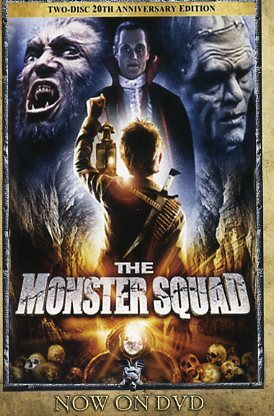 Monster Squad (DVD premium, 2007). 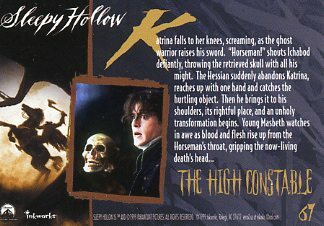 Free oversized cards (3 x 4.5") included in the 20th Anniversary 2 disk DVD release of the series. They are unnumbered and all have identical backs. There are at least 11 different. They are Wolfman, Dracula, Frankenstein's Monster, Mummy, Gillman, Sean, Eugene, Patrick, Rudy, Horace, and Phoebe. They were also given away at the SDDC convention at different booths around the show. Retail: $1-2 each. Monsters, Weirdos & Creeps (2009, Goblinko/Mr. 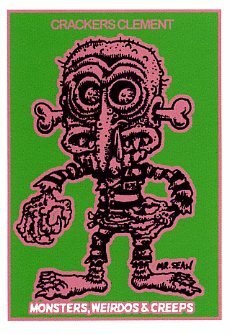 Sean P. Aaberg) Collection of 27 different cards with funky designs in the Basil Wolverton cartooning style. (Think Nutty Initials meets Ugly Stickers.) The fronts are two color, whereas the backs are full color. They were sold in packs of seven. They appear to have been digitally printed on flimsy paper. $2 a pack. 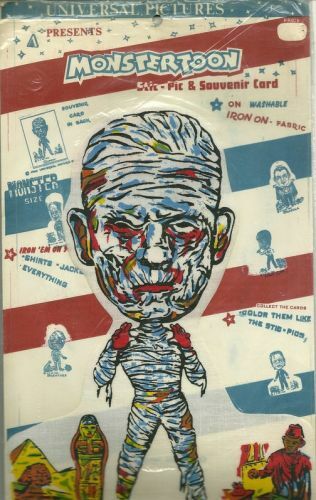 Monster Tatoo (Topps, 1962?) 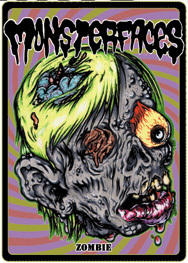 Very rare tattoos with Jack Davis art. The backs form the red wrapper. I have a few dupes and would prefer to trade them for singles from the same series that I don't have. Contact me if you need any or have some to trade. 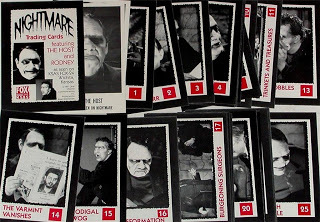 Since there are no numbers printed on the 1960s version of this set, the size of the set is uncertain, but there are at least 75 different images. Retail: $15 each. See our special profile page. 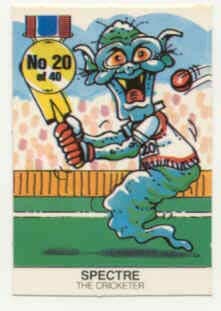 Monster Tattoos Gum, Balloonka (Murry Allen Int'l Incl, 19??) small tattoos that were issued with gum. No numbers, no date, unknown set size and unknown value. 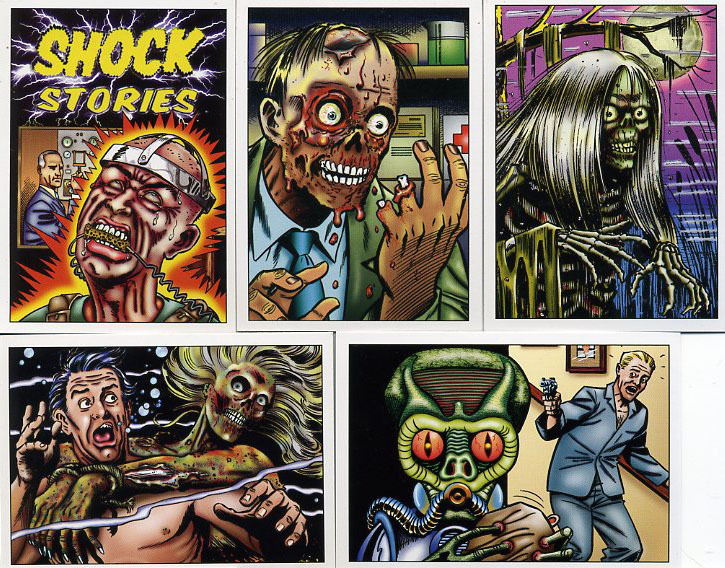 Monster Times (RRParks Cards, 2014) A black bordered 51 card boxed set with images from the covers of the 1970s newspapers series devoted to horror. 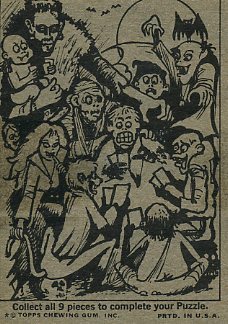 The backs tell the history of the paper (which folded after 48 issues and three special editions), along with a dozen horror cartoons from the paper. (Note: The 51st card is cut out from the wrap around box. The checklist is a foldout piece of paper.) Retail $24. Monster Women Magazine (2014, Sleepy Oni) A 12 card set sold via Kickstarter. Each pack was the same 12 cards +1 kiss-cut sticker, about 100 packs printed. 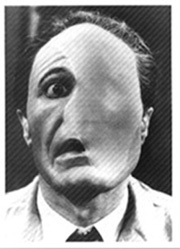 Card faces were 11 various MWMag covers (clean versions, without distressing) and a single image of the fictional cover artist. 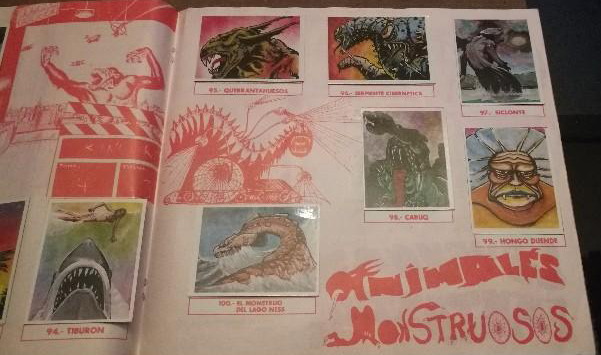 The backs of the base set of 9 cards combined to make a single, larger version of a 10th cover (the two stretchgoal card-backs had drawings of other monster women). The back of the artist card had a brief bio of the artist, Skott Kilander. Retail $25. 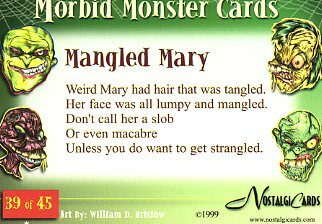 More Morbid Monsters (NostaliCards Co, 2000) Another 45 more monsters in this sequel to the 1999 series (w/ foil parallel cards included). 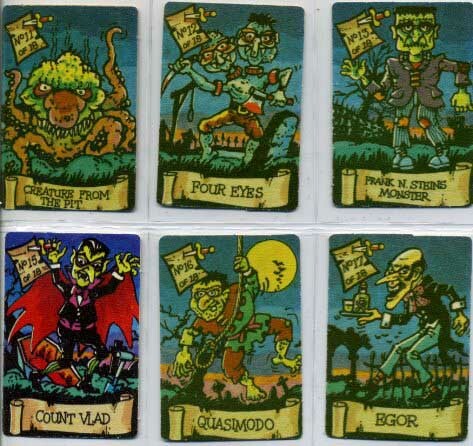 There were also a dozen "Morbid Monster Minis" that were Cracker Jack miniature versions of the same cards. 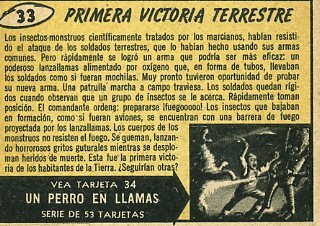 Mundo Del Futuro, El (Spanish, date uncertain). The title translates into "The World of the Future". It's flimsy paper set of somewhat primitive but colorful artwork depicting space ships, aliens, military vehicles, foreign planet landscapes and living habitats of the future. The 225 card series measures 2 1/8 inch by 3 1/6 inches is siz. Retail: Uncertain. Munsters Cars by Johnny Lightning "Fright'ning Lightninings" episode 2. (Circa 2000) Color, unnumbered, blank backed cards featuring famous cars. Two of them have the two cars from The Munsters, (including the actors sitting in them). 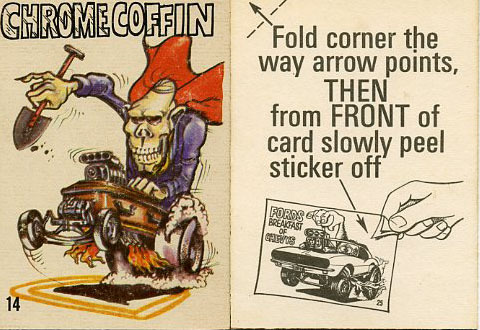 The six cards are The Munsters Koach, The Munsters Drag-u-la, the Heavenly Hearse, Meat Wagon, Surf Hearse, and Carl Casper's Undertaker. Retail: Uncertain. 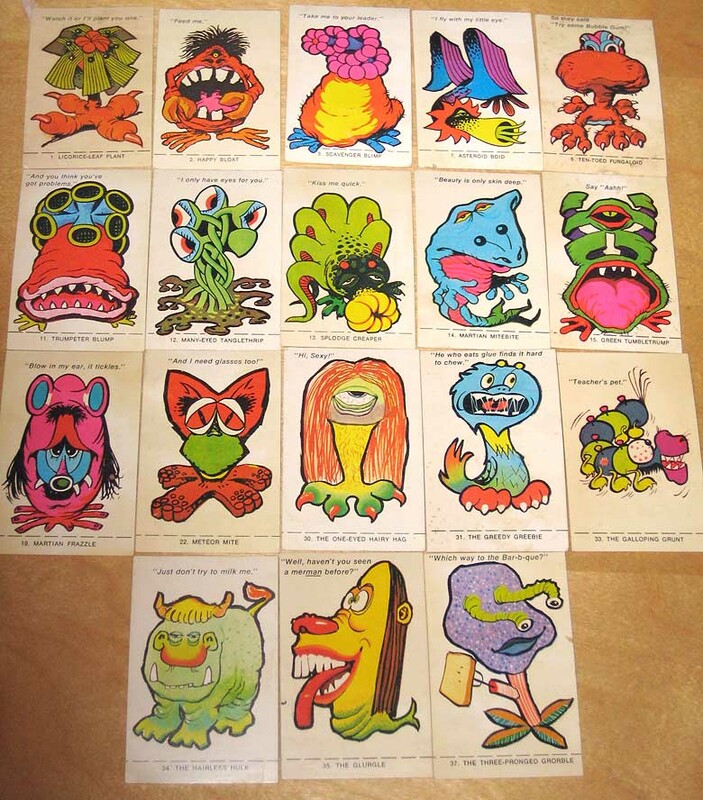 Nestle's Chiller Club (Nestle's, 1966) Very crudely drawn rather goofy monster images (with limericks on the backs) given away with Nestle's product (the drink mix, perhaps?). Set is 50 cards measuring 2" x 3.5" each. Low supply, low demand item. See the extended photo list here. Retail: Uncertain. 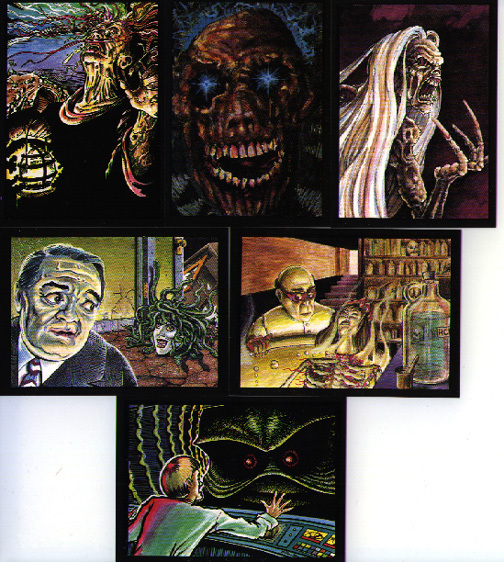 Nightmare Trading Cards (Kilian Enterprises, 1991) A black and white card set (with red titles) that showcased the revived creature feature type show. If featured 25 photo cards of The Host and Rodney from KSAS FOX Channel 24. It also invited collectors to send in $3 and a SASE for two signed bonus cards by the host and his sidekick. The backs included facts about the show, with also a few puzzle backs. Retail $15. 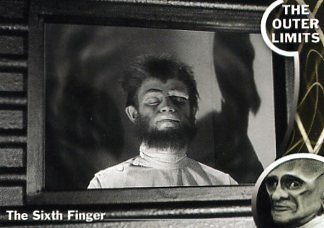 Night Slasher, The (Mystery Playhouse, 2003) 36 color card set that spoofs the 1970s monster TV show, The Night Stalker. 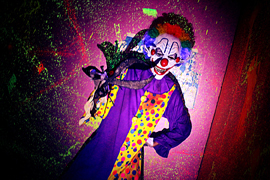 The images are photographs shot on location at a closed haunted house, with full cast and special effects. Only 50 test boxes were manufactured, so no more than 300 sets could be made from them. Retail: $10 per set. See (See review article.) See giftshop. 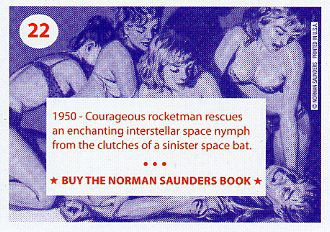 Norman Saunders Trading Cards (The Illustrated Press, 2008). 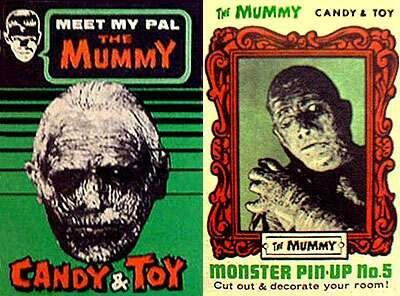 Promotional set of cards that outline the career of pulp and trading card master artist, Norm Saunders (of Mars Attacks fame). 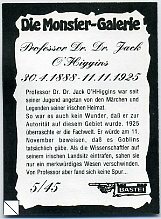 The cards advertise the biographical book written by David Saunders (Norm's youngest son). Only 1,000 sets of the 54 card series were produced. The backs offer sparse text about the fronts. $10. Nosferatu Trading Cards (Drawn World, 2016) A Kickstarter series of 13 B/W cards featuring stills from the 1922 silent movie and text on reverse. Limited to 250 sets. Retail $13. 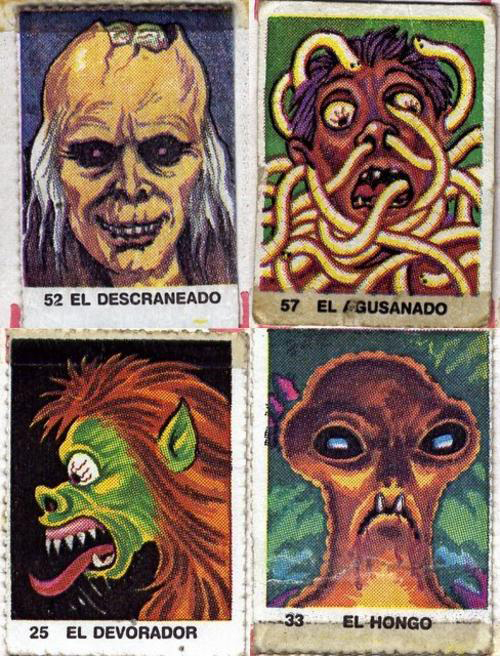 Nutty Initials (Topps, 1967) Not really monsters, more like goofy creatures that form initials (Wally Wood cartoons?). Either one or four intials per sticker. 48 different stickers (blank backed). Norm Saunders was the artist and designer behind this set. The art was later recycled for an Irish release by Topps in 1977 (note the 1977 copyright on the front). Retail: $4 - $15 each. Outer Limits (Bubbles aka Topps, 1964)- 50 colorized photos from the classic TV show. The corny stories on the back only made it more endearing. (They had nothing to do with the actual stories from TV.) The black borders were easily chipped. (Beware of retouching with black markers on the edge.) There is supposedly a variation from the 1 cent packs that have blue backs instead of yellowish-green backs. 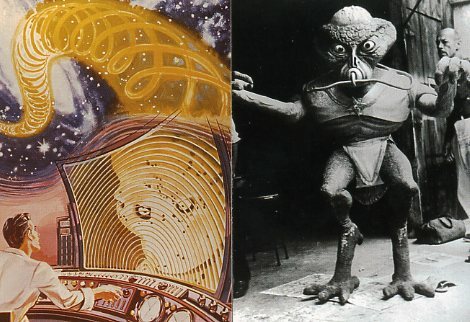 Two different photos on the fronts from that variation were supposedly #2 ("Radio-Active Man" was originally called "Woman From Another Time") and an unknown card number called "Thing From Venus." Both featured different photos from the current ones. Retail for regular series: $350-500 Ex/Nrmt (Be aware that UK Topps issued the same series in a smaller version which sells for less, and that a pirate reprint of the regular series was printed in the 1990s. That reprint can be easily distinguished by the white background behind the text on the backs, instead of the yellow background found on the originals. 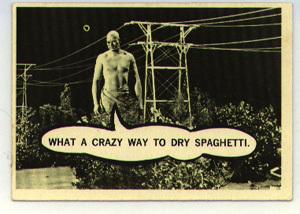 There is also additional parody cards posted on the web for cards #51-54, but they were never printed as cards on cardboard.) See more of set. Here's also a fun article by Gerry Gerani with card writer Len Brown. 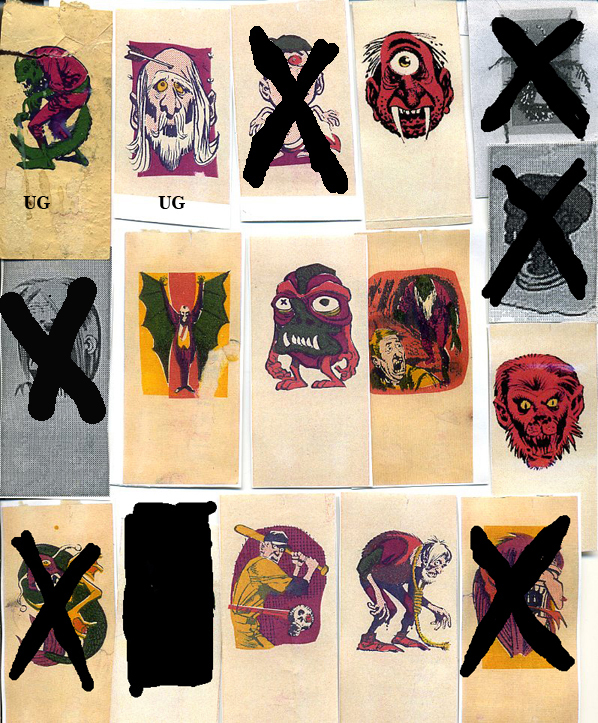 Outer Limits Board Game (circa 1960s) Set of (about) 40 cards with crude art depicting monsters form the Outer Limits to play in a board game. Most the images were four part puzzle pieces, but each also had a card with the completed image on it as well. See back. Retail: Uncertain. 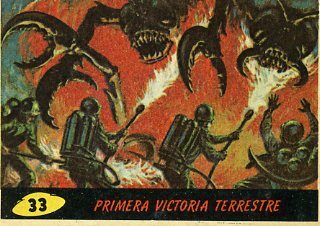 Otros Mundos (Libro Para Cromos, Spain, 1984) 243 color cards of aliens, space monsters and space ships. (They measure 2 1/8" x 2 15/16") A large album was also offered to paste them in. Retail: $100. 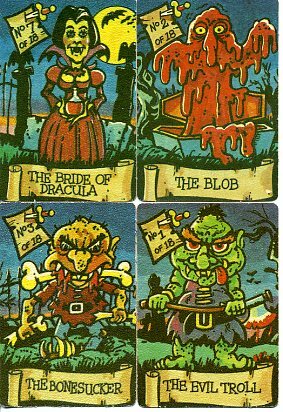 Pizza Monster series (Grand Cheeze company, 2000) Set of five cards featuring cartoons of pizza slices that are walking, stalking monsters. 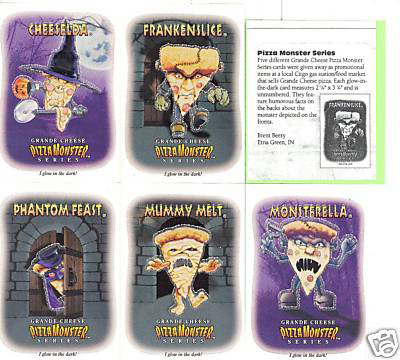 Titles are Phantom Feast, Mummy Melt, Moniterella, Cheeselda, & Frankenslice. Low supply, low demand item. 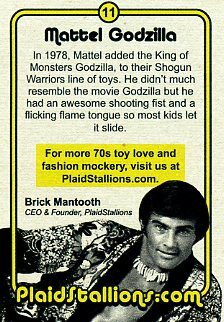 Plaid Stallions (Mego Museum, 2008 & up) An ongoing series of flimsy cards devoted to various toys from the 1960s and 1970s, many of which are monsters. Only a few cards are produced every few months, so the set size has yet to be determined. (See back). Retail: Not for resale. Quentin Post Cards (Philly Gum, 1969) 12 cards with black & white photos of David Selby (Quentin Collins from the Dark Shadows TV show.) Retail: $5 per card. See more of the set. Re-animator (Fright-Rags, 2017) A full color 60 card factory set that story-boards the classic horror flick, starring Jeffrey Combs and Bruce Abbott. 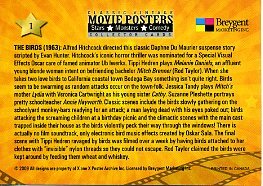 The backs are chipboard with trivia and short facts about the film. 75 wax boxes were also produced, which included 9 different stickers and 23 different chase cards. Retail $20 for the base set. 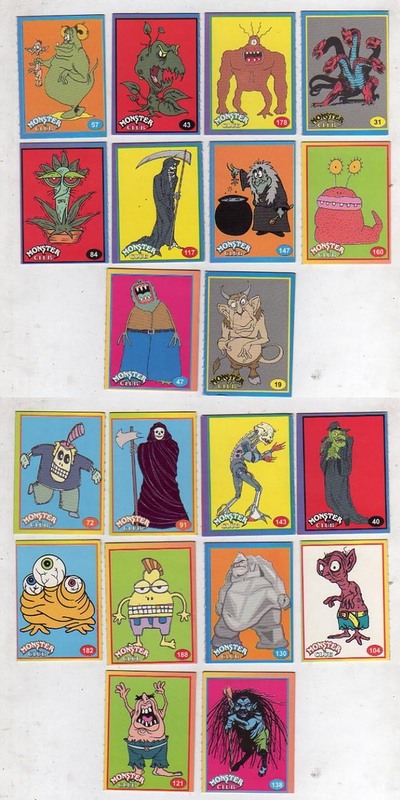 Scary Monsters Card Set (Denis Druktenis Publishing, ?) 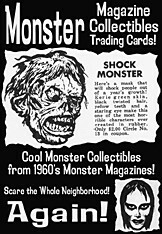 9 card set of black & white photos of Aurora monster models. Images are dark with an all white background printed on flimsy stock. The backs form a puzzle of another model. The 9th card is a certification card signed by Sam Scare. Limited to 1,000 numbered sets. 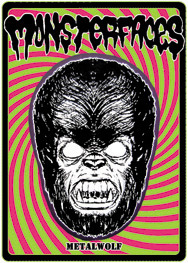 Scary Monsters Movie Parody (Denis Druktenis Publishing, 1994) Color parody drawings of classic monster movie posters and lobby cards from days gone by. 36 card set retail $12. An extra Ron Foss autograph card is also available. Scooby Doo Movie (Inkworks, 2002) 72 card photo set with chase. Scooby Doo 2: Monsters Unleashed (Inkworks, 2004) 72 photo card set. 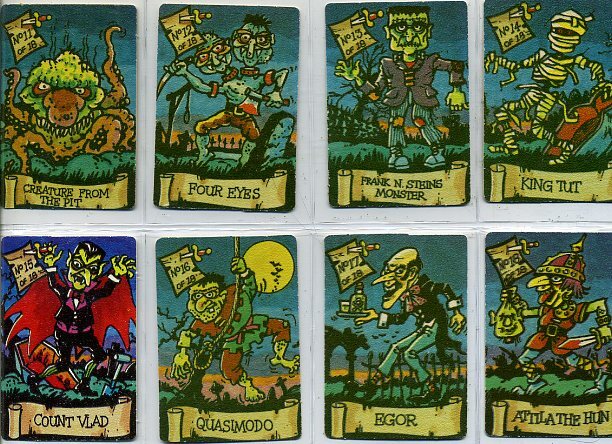 Scooby Doo Happy Families (Carta Mundi, 2002) 32 oversized cards make up this game set. 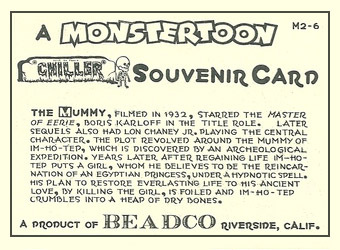 Scooby Doo: Mysteries and Monsters (Inkworks, 2003) 72 card set on the cartoon. 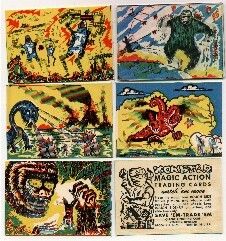 Secret Island (Geo Bassett & Co. (UK) 1976) A British set of 40 mini-cards with childlike, cartoonish depictions of monsters. The backs have sparse info about the character and artist who drew it. It looks as if the series was made up from "prize winning entries" to a monster art contest aimed at kids. (See fronts and a back.) Low demand item. $10. Shock! Theater Classics (ARCO, 2010) This series of 37 black & white cards (although the cover card is actually in color) has photographs from many classic monster movies (mostly Universal). The fronts include an oval with a title, and the backs contain serious commentary on the films. 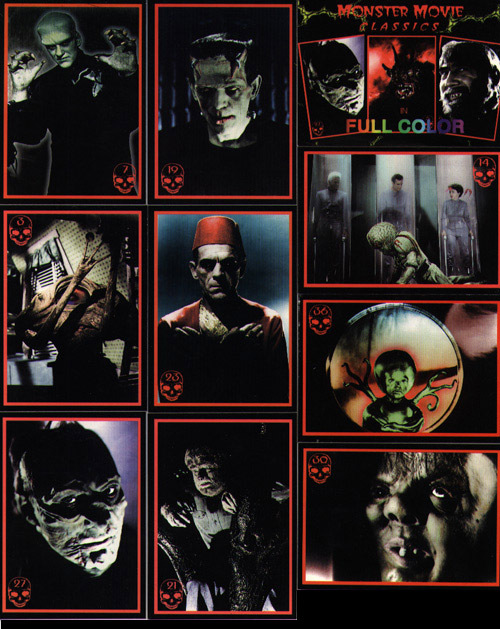 There are at least 3 full color stickers as well (mine had Frankenstein & Dracula posters, and the cover art to the first Shock magazine). Both the cards and stickers were printed digitally "on demand", so the print run can continue to increase as time passes. The stock is somewhat flimsy. Retail: $30. 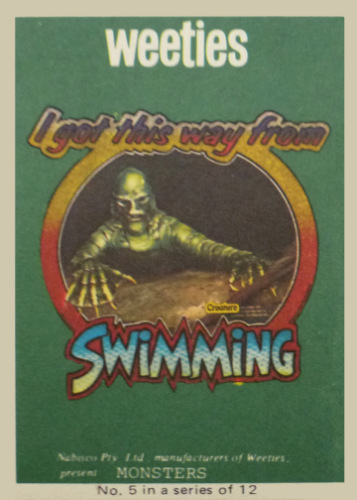 Shrimpenstein Fan Club/ Monster Green Stamps (Fred Rice Prods. 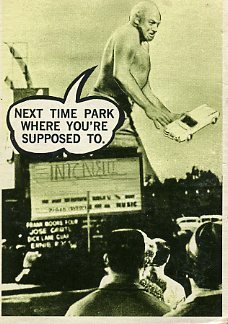 Inc, circa 1967). This was a black on green sticker set that sold for $1 to fans of a puppet program from KHJ channel 9 in LA. The hosts were Gene Moss (Dr. 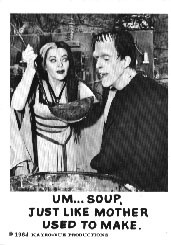 Von Schtick) and Jim Thurman (voices) and it ran from January 1967 to sometime in 1968. 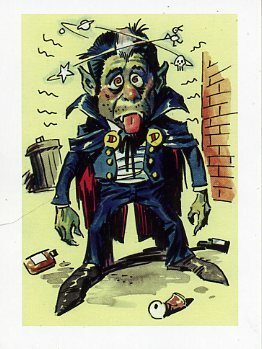 There are 15 in the set with the artwork inspired by another Fred Rice card set, Dracula’s Greatest Hits. The titles were Punky, Hemi-Head, Wilfred The Wiener Wolf, The Zombie, Surf Monster, Ugly-Buggly, Dr. Rudolph Von Schtick, Musty, Scampira, Twick’n Tweat, Screama, Shrimpenstein, The Tijuana Bats, Squid Kid, and Weirdo. (Low demand, low supply item. Exact card size unverified). The backs were brown peel off sheets. Retail: Uncertain. 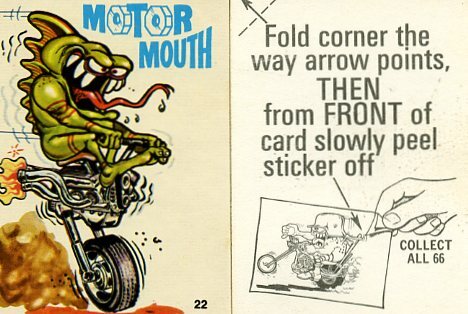 Silly Cycles (Donruss, 1970) Goofy monsters riding various super-motorcycles. 66 color stickers. Many of the backs feature drawings sent in by Odd Rod collectors. Retail: $250 Nrmt. 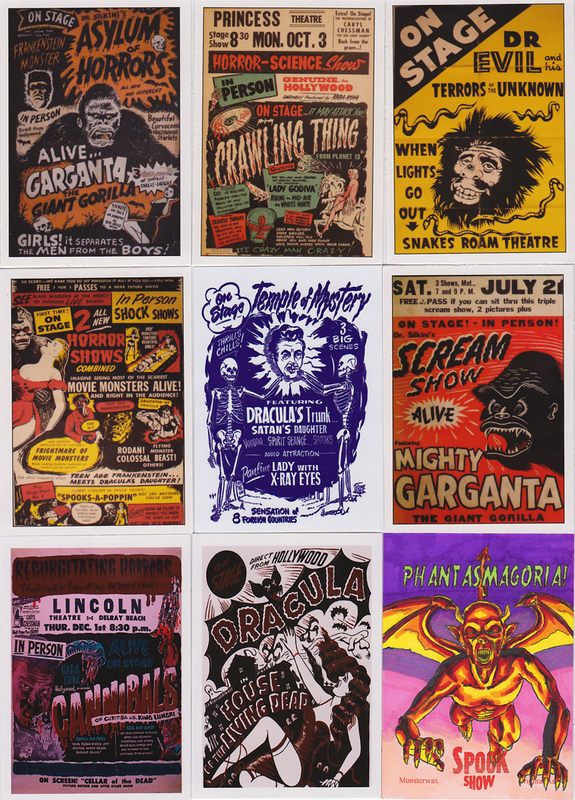 Silver Scream Spookshow (The Plaza Theatre, circa 2010) A 36 color card set given away in five card packs. The photos profile Professor Morte & "Retch", his Igor like side-kick. Prof. Morte performs live spook shows in the Atlanta area at the Plaza Theatre. There is no copyright date, but they were printed before 2012. Retail: $2 a pack. 60's Sci-fi & Terror TV (Funfax, 1994): Very scarce series containing the classic sci-fi & horror series from the golden age of TV. The photo fronts feature pictures and the backs contain info on each show. 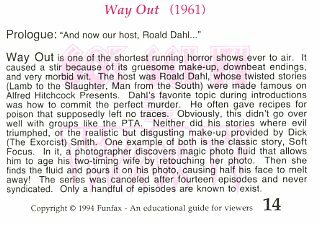 It profiles every TV sci-fi & horror series from the 1960s (Time Tunnel, Alfred Hitchcock, Wild Wild West, The Invaders, Twilight Zone, Thriller and Way Out, etc.) 50 b/w card set. Retail: $40. See Set Profile. 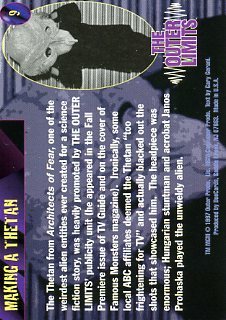 60's Sci-fi & Terror TV, The Sequel (Funfax, 1994): A follow up to the first series 1. It picks up at card #51 and goes to #100. Has a salmon retro graphic on the backs. Each set is numbered and limited to only 2,000. 50 b/w card set. Retail $15. See Set Profile. 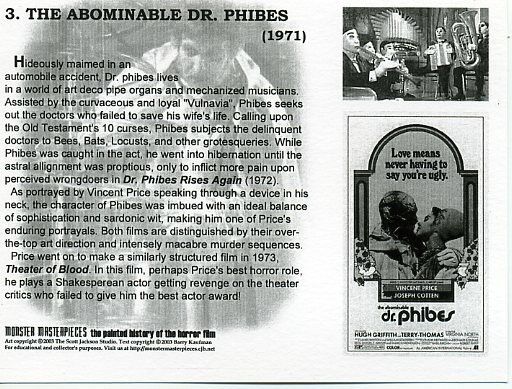 60's Sci-fi & Terror TV, The Sequel Chase set (Funfax, 1994): P1-P6 chase cards. Each chase set included a card-sized certificate numbered one of only 750. Profiles The Prisoner sci-fi series. 6 b/w card set, Retail: $12. See Set Profile. Spectreman (Epoch Co., 1999, Japan) Colorful, borderless cards showing photos from the Japanese TV show of the same name. Like Ultraman before it, the super hero is super sized, and does battle with giant monsters who menace the (miniature model) cities. I have only seen samples of this series with numbers as high as 45. The reverse is printed in Japanese only. The total number in the series is unknown, as is a realistic price. 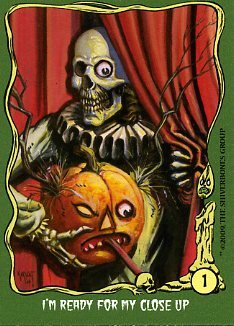 Spookshow Funnies (2009, Shiver Bones Group) A 27 card set featuring the Halloween postcard art of Matthew Kirscht. Limited to just 50 sets, but sold in packs of three for $18 per pack. 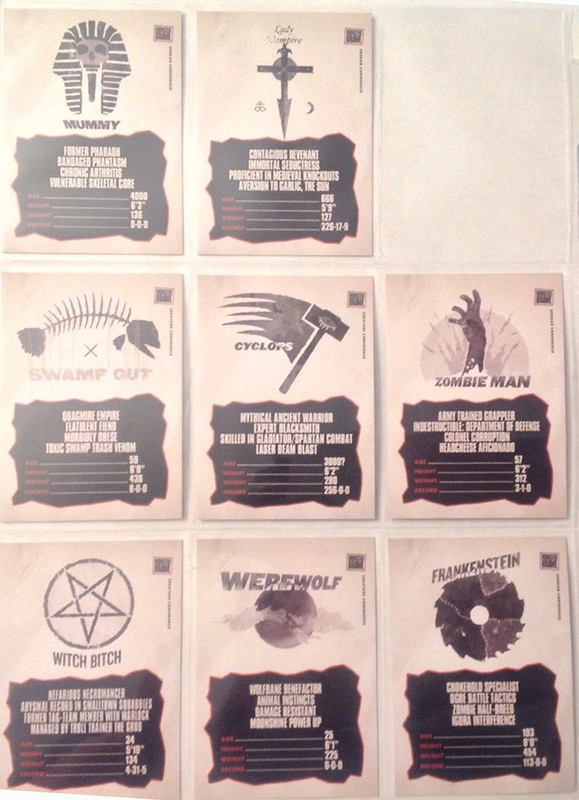 The backs alternate between "True Weird Things" (supernatural tales) and a 9 card color puzzle. Most of the backs were hand signed by Kirscht. (See back.) Retail: $162. Spook Show (2011, Monsterwax) Retro series profiling the vintage horror posters that promoted macabre magicians and their midnight spook shows. 66 cards comprise the base set, and numerous chase cards were included in the 500 boxes published. See Set Profile. Retail: $15. Spook Show Trading Cards, Vintage (Curiosity Emporium, 2011) See Vintage Spook Show Trading Cards. Spook Stories (Leaf, 1961) This series is copyright 1961, but was actually distributed in two series from 1963 to 1965. 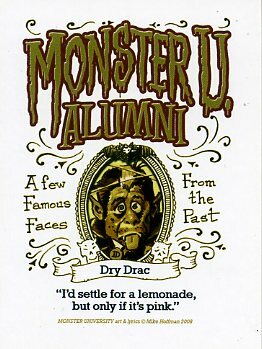 Two series of 72 black and white cards featured photos from various Universial monster movies with gag on-liners beneath them. 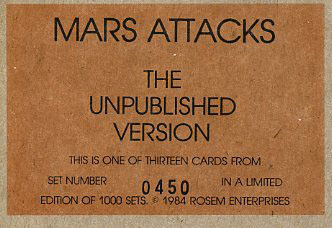 The packs were sold with a smaller full color sticker, which eventually composed an unnumbred set of 48. The stickers had backs that had "lick'em to stick 'em" glue, just like postage stamps. If the adhesive is uneven or appears brushed on, it is likely a counterfeit. Series 1 card set retail: $200 Nrmt. Series 2 card set retail: $350. Unnumbered blank backed stickers, $18-$28 each Nrmt. (see back.) (Read an article on the sticker series with checklist) See more of the set. 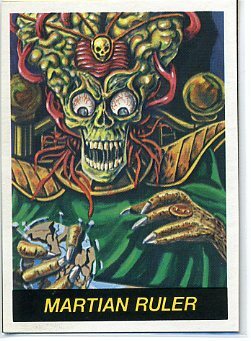 *Stargate (movie) (Collect-A-Card, 1994) 100 photo card set devoted to the movie which spawned the popular sci-fi franchise. 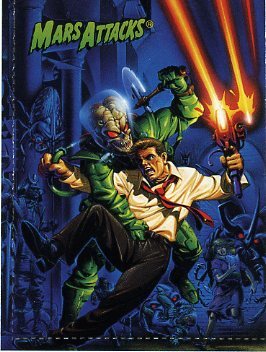 The big bad monster in this series is an alien parasite that controls the mind of its host, but many different alien races are depicted in the shows that follow. The series started with this movie, then nine seasons of Stargate TV (plus four seasons of Stargate Atlantis, the spin-off show), then Stargate Universe (another movie) and even Stargate Infinity (a cartoon series). Together, Stargate resulted in at least 15 different card series. 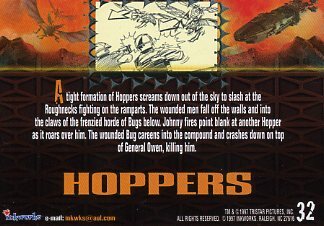 Starship Troopers (Inkworks, 1997) More sci-fi than monster, but the villians are vicious bug monsters! By the same director of Robocop, a very worthwhile film and decent set too. See back. 81 color card set. Retail: $20. 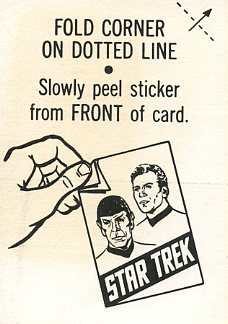 *Star Trek (Leaf, 1967) Series of 72 black and white cards based on the TV show. Only two of the original Star Trek card series are included here to acknowledge a popular sci-fi show that was more sci-fi than monster oriented. The Leaf set was withdrawn soon after release due to licensing issues, and originals are quite expensive ($1,200 in EX). There are several knock-off reprints, including ones that claim to be "European" from the same era. (This claim is considered to be false. If they were from the same era, they would have used the same film-- not reshot the images using inferior cameras. The reprints are noticably less sharp.) Some of the fakes state "reprint" at the bottom of the backs with a 1981 copyright, while others do not. The easiest way to tell real vs. fake is to look at the cards from the side to see if the edge is solid white. The fakes use all white paper. 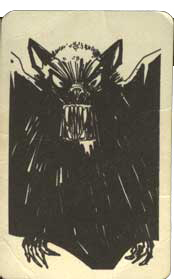 The originals used gray cardboard with a white glossy paper finish on the outside. From the edge, the original Leaf stock looks like a sandwich, with smooth white on the outside, and gray cardboard within. (See review article.) See more of the set. 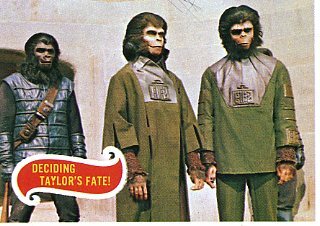 *Star Trek (A&BC, 1969) A slightly smaller sized color card series issued in England (2 3/16ths x 3 3/16ths). All 55 cards feature photos from the episode What Are Little Girls Made Of? which starred Sherry Jackson and Ted Cassidy (aka "Lurch"). 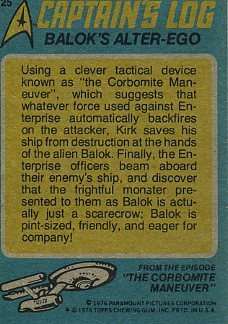 Unlike the other Star Trek cards, the backs feature an ongoing story... plus oddball space facts, like the name of the first dog in space. Retail (EX) $350. *Star Wars (Topps, 1977) Five different series started this ongoing franchise devoted to the movie (and later on, the sequels and prequels). The card sets are each 66 cards and 11 stickers, and continue the numbering sequence from 1 to 330. 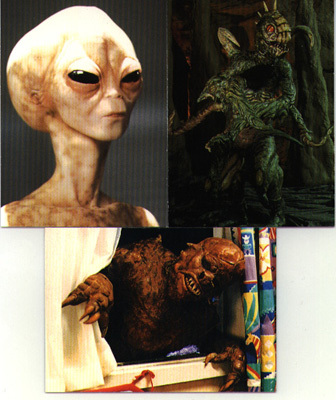 Although there are only occasional monsters, there are countless aliens. There are nearly as many sequel sets, but only this first series is included here (as a space holder for fans). Retail all sets combined, $150. 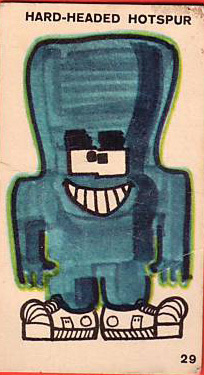 Sunicrust Monster Cartoon Cards (Sunicrust Bread, circa 1970, Australia) Series of 40 different cards that were included for free within the Sunicrust packets of bread. Staining from the bread is common. Like many foreign items, this is a low supply, low demand item. Retail: Unknown. 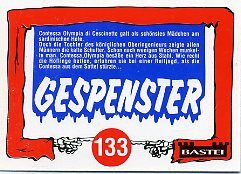 Super Cinema Movie Poster Cards (Due emme Publishing, 1996) 144 different full color movie posters on oversized cards. 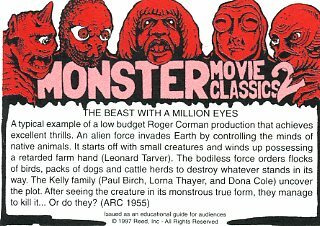 Several were monster movies, many were not. Measured 3 1/8 x 3 15/16". Back facts in Italian or Spanish. Retail: $20. 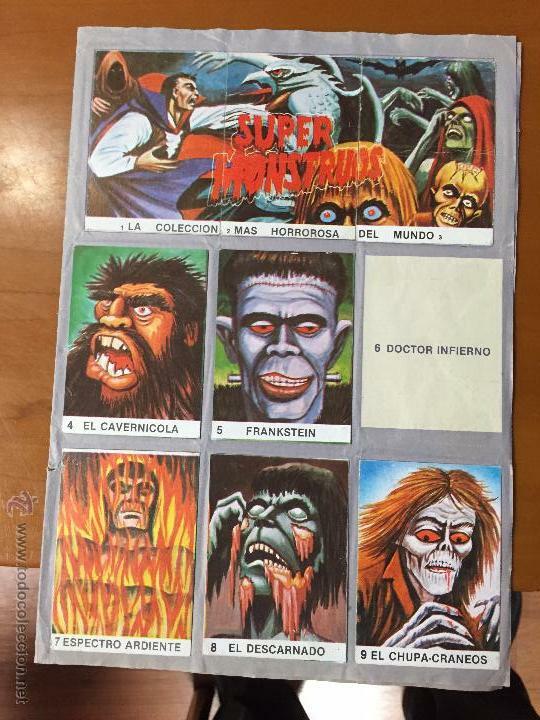 Super Monstruos [cards] (Numulite (in Spain), 1987?) 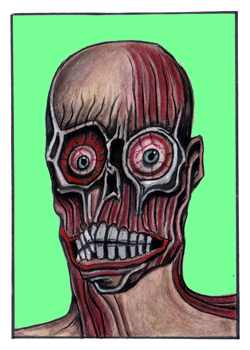 Series of 36 colorful drawings of monster faces, each numbered and titled. #25 (Tigorr) was the scarce one. Something about the art style of this set makes it especially appealing to me. The goal of collectors was to paste them into a four page album. Retail for set: $100. Terminator Salvation (2009, Topps) 90 card series with the 4 (and final?) Terminator story starring Christian Bale. The stories on the back include "behind the scenes" information as well. 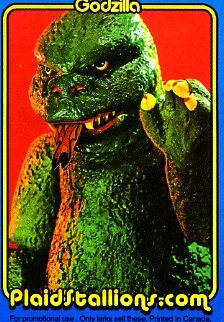 Terror Monster Green & Purple (Rosan, 1963): These looks so primitive, you can't help but enjoy it in an immature sort of way. The quality stinks, any kid with a photo copy machine could do a better set today- but that only adds to the charm. 132 cards (both series combined). The Retail: on both these sets has reached surprising highs. Expect to pay between $400-$600 per set in EX. 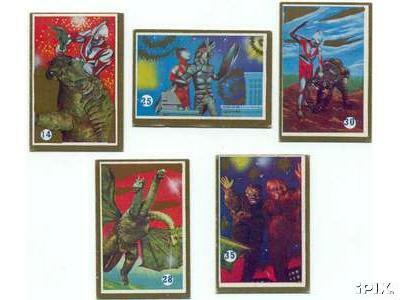 Series 1 (green) is cards 1-64. Series 2 (purple) is cards 67-132. There are also two unnumbered bonus cards (usually considered #65 and #66, though no number is on them). These bonus cards often run between $100 to $200 each and have purple borders. The purple series 2 (#67-132) comes in TWO varieties: 1.) Regular b/w photos with a crude reverse graphic arched above a joke (usually called the "arch backs" variety) and 2.) 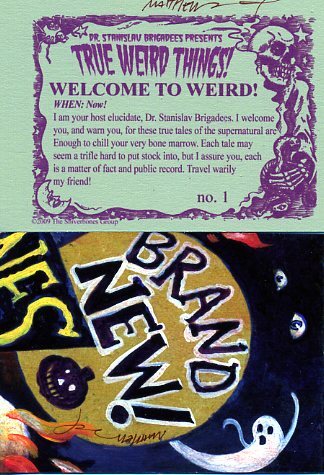 A duotone variety (often using out of register photos) with a small skull and crossbones graphic in the top right and bottom left corner (with the joke in the middle). You can see both purple varieties here. (View green backs and regular purple backs.) See more of the set. 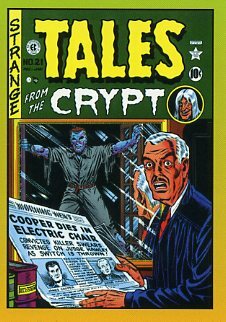 Terror Tales (Scanlens, Australia, 1969): The same series as the 1967 Topps version, but only 66 cards are in this set (instead of 88). The copyright reflects the different trademark, date, and Aussie printing, but otherwise, the backs are also the same. Retail: Unknown. 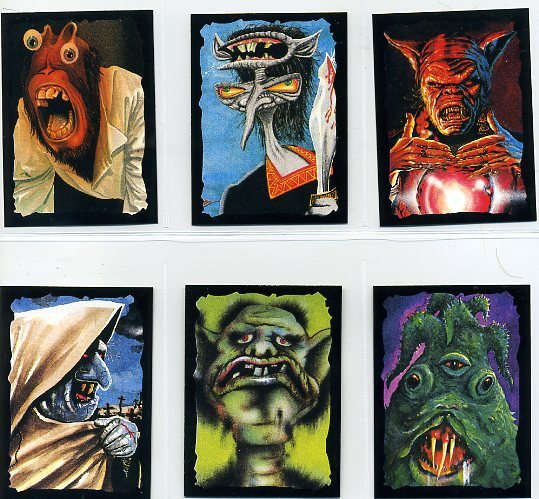 Terror Tattoos (Topps, Ireland, 1990s? 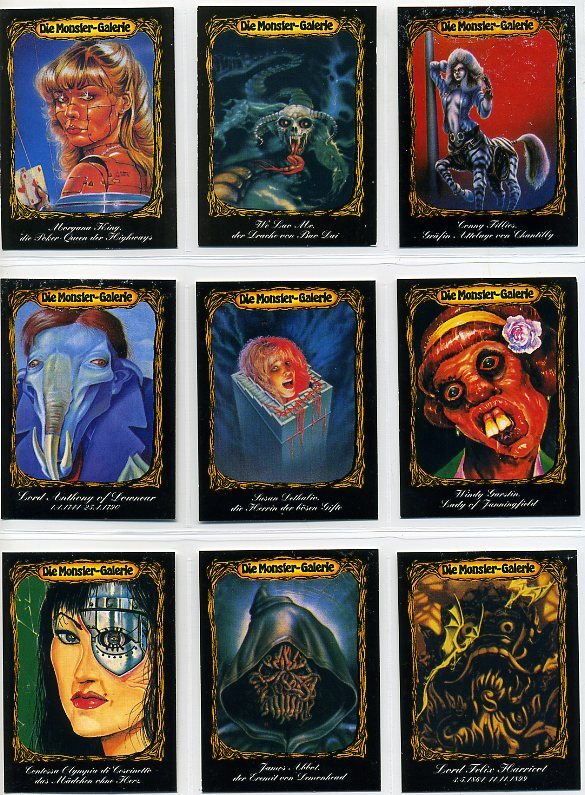 ): Produced overseas for European distribution, this collection of 25 different "terror tattoos" came along with 20 puzzle cards (to make two different puzzles). The backs of the cards give instructions on how to apply the tattoos and the fronts make up the large nine card poster (plus two cards with the complete puzzle image). Retail: Unknown. 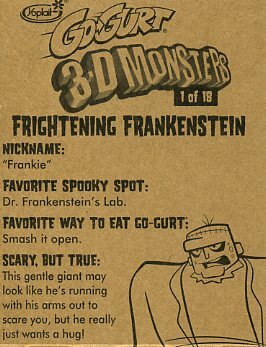 3-D Monster Cards (Yoplait/ GoGurt 2005) Three Dimensional effects could be enjoyed with this set when you looked at them with the three-D glasses, which came with the GoGurt box (along with two cut-out cards). 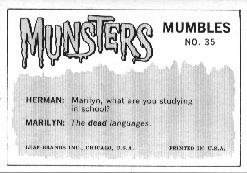 They were typical monsters, but made "friendlier" as not to offend parents (and to avoid paying Universal any royalties!). Examples include #3 Howlin' Werewolf, #4 Phantom Pirate, #7 Count Dracula, #8 Witch Doctor, #15 Spooky Scarecrow, #16 Haunting Headless Horseman. There were 18 total in the set. (See back.) Retail: Unknown. Time Machine, The Art Of HG Wells Series 1 (Monsterwax, 2005) 27 card set (+ checklist) of color paintings faithfully recreates the famous HG Wells story. Only 166 numbered boxes made. Each checklist was individually numbered 1 to 1,000 and was distributed in the boxes. See set profile. 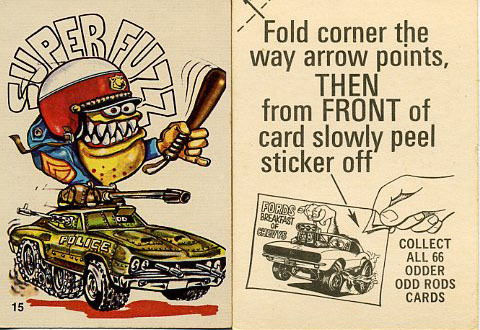 Topps Pak O' Fun (Topps, 1969) Two card panel set of 42, almost the size of postcards. 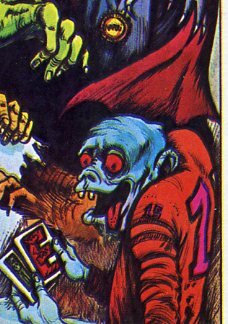 Many of the cards have Halloween themes, like Halloween finger puppets (image reduced), and several of the cards are re-issued images from the original Jack Davis Funny Monsters (issued in two card panels). Retail: $750 Nrmt. 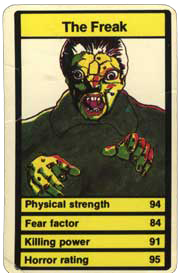 Top Trumps (Waddingtons (UK), circa 1980s) Two sets of 32 were issued sometime during the early 1980s in the UK. These are game cards with identical backs. Low supply and demand. Retail: Unknown. Tune In For Terror! 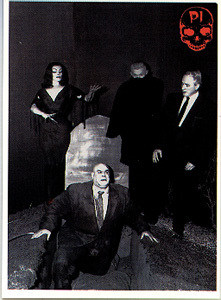 (Mystery Playhouse 1992): Artwork set depicts radio's golden age of horror. The first third profiles the famous radio shows of that era, the middle section profiles the classic writers who inspired many of the shows, and the last third tells short horror stories. Less than 1,200 numbered sets of the duo tone set. were made, and then a full color version was released in 500 (36 count) boxes. 33 cards and 9 sticker set. See backs. Retail: $10-$15. See Set Profile. Tune In For Terror! 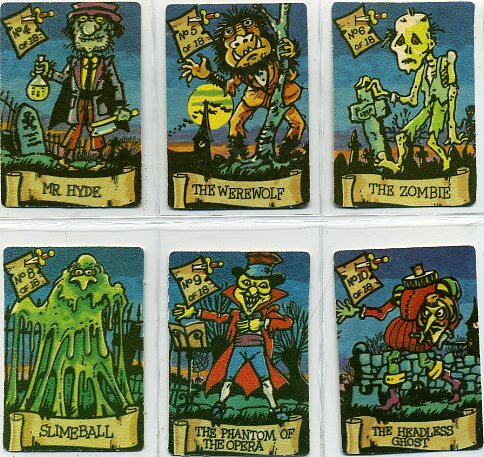 Prototype Extension Set (Mystery Playhouse 1992): Six card series sold with the color series numbered 43 - 48. 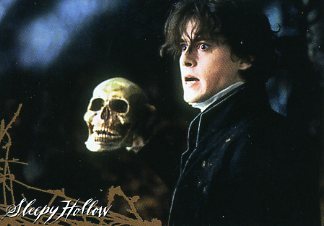 (They featured the same artwork as the extreamly rare autograph cards) 966 numbered sets were made. Retail: $12. See Set Profile. 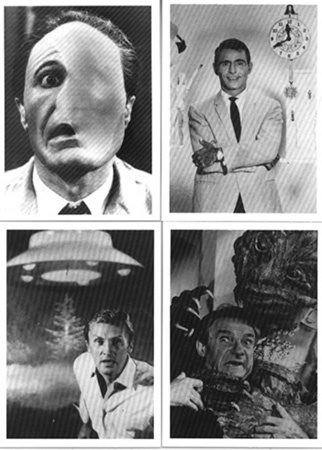 Twilight Zone (Unknown, circa 1990s) A thirteen card set of black and white drawings that seem to promote various stories from a Twilight Zone book or magazine. No company info is provided, but a header card claims the series is limited to 5,000 sets. Retail: Uncertain, but probably around $8.